The last major G20 report focused on what actually happened on the ground; this one looks earlier, to the procedures that were set up to help manage the summit in the first place. 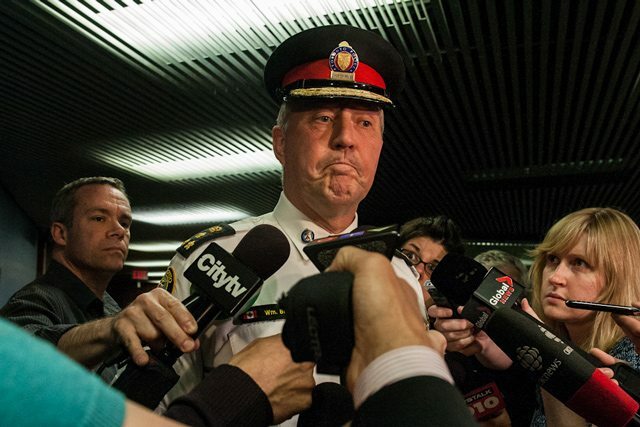 Toronto Police Chief Bill Blair after the police board meeting in May. Today, the Honourable John W. Morden will present the Independent Civilian Review Into Matters Relating To The G20 Summit’s official report [PDF] to the Toronto Police Services Board. Like the Office of the Independent Police Review Director’s report before it, it is unsurprisingly critical of the various governments and authorities planning for and response to the G20 summit and what went on while that was happening. Also like the OIPRD report, this report is extremely long (weighing in at a hefty 425 pages). However, it is not duplicative; it surveys terrain the previous report didn’t address in full. Perhaps reflecting the fact that this report was always going to be presented to the Toronto Police Board, it focuses a great deal on the Board itself, which it portrays repeatedly as having had its powers of oversight usurped by other entities: the federal government and the Toronto Police Service lead the way in these areas. The report notes that the Board was not nearly proactive enough in attempting to properly assert its powers of oversight, failing to properly request information about (deep breath): the legal framework for policing the G20 summit; the requests the TPS made for additional policing powers (and the responses to those powers); the role and function of the Integrated Security Unit and how Toronto police would work within it; how the TPS would police the city during the G20; the command and control structure for security forces during the summit and how Toronto police would work within that; training provided to officers; and what authority the Board had over visiting police officers from other cities—among other topics. In fairness, the report also notes that the Board was stonewalled, generally deprived of information, and even outright intimidated by those it questioned. The report spends approximately 20 pages discussing the training of police for the G20. Morden again calls out the Board for failing to be properly involved, but his primary criticism here is that the training methods used—a combination of online training modules and some in-person instruction, with the emphasis on the former—were clearly not sufficient and that, even though there was a time-crunch (regarding which, incidentally, he is extremely critical of Stephen Harper’s federal government for not nearly providing enough notice to city and provincial authorities about the G20 being here in the first place), some classroom instruction could have gone a long way towards better preparing police for the G20. As previously mentioned, Morden only briefly discusses police interactions with civilians during the G20; however, as he is discussing procedural and planning issues with the G20, he concludes the report with harsh criticism of the Prisoner Processing Centre, covering many of the operational failures that the OIPRD report did, but looking at them primarily from a planning perspective, since in Morden’s view, it was the planning failures behind the PPC that made it so galling. He suggests that proper preparation could have been taken with respect to processing youths and adults together, availability of counsel, suitability of full-body strip searches, etc., and lessened all of these failures dramatically. (This writer is not sure that he agrees with that conclusion, but it is a fair position to take.) Morden also strongly recommends that the board amend existing policies to ensure that in the future, youth prisoners are processed in accordance with existing youth justice laws, and that transgender and transsexual prisoners be taken into account with respect to separately gendered detention areas. Simply put: this is not a report for people looking for further condemnation of the police abuses during the G20. It is a wonkish policy document that acknowledges those failure and then asks, in detail, how those failures came to be. That makes it a worthwhile but dry read. The Toronto Police Services Board meeting begins today at 1:30 p.m. You can watch a live stream of proceedings here.